I have often heard people talk about “quality literature”. It is the idea that some written works have more value than others. Certainly some books are more interesting, have better written characters, or have cultural significance, but some texts are completely disregarded based on their subject matter. An example of this includes any Mills & Boon paperback, most romance novels, erotica and other such texts. No one takes a Mills & Boon seriously, no matter the quality of character development, setting or plot. Another type of “trashy literature” is fanfiction. Man, I am terrible at this who “blog everyday” thing! So, for some unknown reason, I have signed up to participate in Blog June. God only knows why. Just take a look back through my blogging history, and you will know I am hardly a regular poster. But I have put my name up for it, so I might as well stick with it. A while back I posted about the difficulty in trying to devise a costumes for PAX Australia that is wheelchair friendly. In the end, Sam and I decided on generic steampunk for the both of us (that way we can reuse components from both our costumes for future expos and conventions). 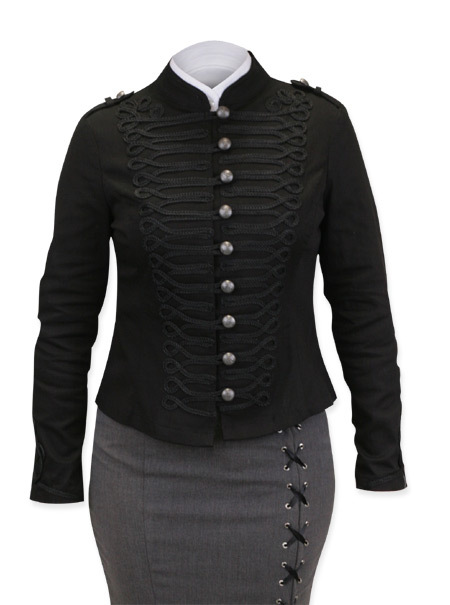 I have just ordered this amazing jacket from the Steampunk Emporium, and intend to match it with some white leggings and some black combat boots.